I noticed over the Labor Day weekend, I am feeling a bit better. The middle fingers on both hands don't hurt as much as they did. I'm having some cramping in my right hand, particularly after a long day of using the computer mouse both at work and at home. My right wrist doesn't hurt in the morning as it used to. My knees are still bad, however, there is minor improvement there. I actually sat on the side of the bed one morning in August, just sobbing because the thought of the pain of standing up was overwhelming. It still hurts to stand up or sit down. But it doesn't take me as long to get moving, without much pain, as it did. I had to drive to Milwaukee last week and had some problems with pain in the right knee, but otherwise, it's not bad. I can stand on my feet for longer without pain in the knees. I'm not willing, yet, to chalk this up to the addition of the bracelet. It's possible the bracelet has helped. It's also possible that my rigorous attention to making sure I take the Meloxicam and the glucosamine/chondroitin is also a factor. I also may have simply accepted some pain as part of my life now. But when arthritis treatments, particularly homeopathic or low cost, come through on the health web sites I read, I stop to take a look. One came through today. Bee stings. Um...no thanks. There's some evidence this might work but still, no. Snake venom. Again...no thanks. Supposedly, there is a product in development to utilize the anti-inflammatory components of snake venom. I'll wait for that, thank you very much. WD-40. Leave that for creaky wheels and stuck windows not your knees or elbows. Copper bracelets. This falls under the same thing as my baltic amber. Evidence is strictly annecdotal. Gin-soaked raisins. Raisins and juniper berries have anti-inflammatory properties about them. You soak golden raisins in gin for a week and then eat 10 every day. I've never liked the taste of gin but I love golden raisins. Honey and cider vinegar. Take an equal part of each and mix into a glass of warm water. Drink. Although this has not been studied, it's one of the few arthritis remedies that doesn't have a side effect to it. Skip veggies from the "nightshade" family. This means cutting peppers, tomatoes, eggplant and potatoes from one's diet. That would mean no fries, no "red" sauce in Italian dishes. I don't know. Ginger and tumeric. These spices have scientific studies behind them to prove they do reduce joint pain and inflammation. I'm going to need to do some research to see how much and the frequency of use. The best one however was Gelatin. 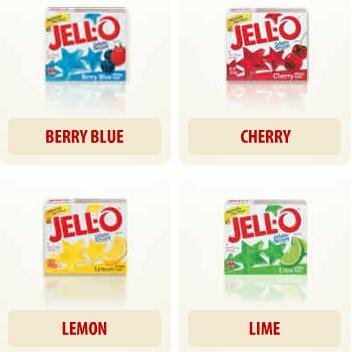 Yup, good old jell-o. Gelatin is, in reality, ground up cartilage and there are limited studies that indicate it may help with joint pain and inflammation. Sugar-free is not an option for me. It will have to be the regular sugared variety. I can't find how much to eat and whether it should be daily. I'm thinking some tests are in order here. You don't know how tempted I am to send you a ton of gin-flavoured jell-o studded with gin-soaked raisins . . . Raiding would be a blast! Offered seasonally. I don't see ANY gin-flavored jello amongst the offerings. Maybe you could write them and suggest it.